From seafood and ethnic fare to pizza and steak, there truly is something for everyone in Acadiana. Perhaps we are gluttons for punishment, but over the past several months, we’ve endeavored to narrow down what we think are the best restaurants in the region. We hope you have as much fun debating and trying them out as we did. Life in the Deep South may be easy, or so the George Gershwin song claims, but choosing great restaurants is not. Oh, we have plenty — and that’s the problem. How to choose? We’ve narrowed down some of our favorites, dining establishments in several categories that will tantalize the senses. Some are new, such as Central Pizza & Bar in downtown Lafayette, creating flavor marriages on pizza that’s quick fired in a brick oven. Some have been around for years, such as Mr. Lester’s Steakhouse at Cypress Bayou Casino, routinely nabbing accolades. One thing’s for certain. If it’s Cajun Country, it’s going to be a good time. So, pick your culinary specialties and visit some of Acadiana’s best. It’s easy to spot a great restaurant — just look for the lines. At Cajun Claws in Abbeville it’s what you’ll find almost every night the restaurant is open during crawfish season. Cajun Claws began when paterfamilias Donni Choate needed to bring in extra income to the family. He bought and graded crawfish to sell to the public from a small location on Abbeville’s State Street. The business turned a nice profit so the family bought the current building in 1996 and began serving crawfish as well. Word got out and people began flocking to enjoy the Choate’s steaming boiled crawfish, even though the wait sometimes meant standing outside in the elements. In 2007, the family created a bar to allow customers to enjoy drinks while waiting for a space at the 14 tables. Customers may also tailgate in the neighboring field or parking lot. Cajun Claws typically opens in mid-December but for only a handful of days. By the time crawfish season kicks into gear, the restaurant will be open 4 p.m. to 9 p.m. — or until the crawfish runs out — Tuesdays through Saturdays. In May, the family closes shop. During crawfish season, Donni Choate rises every morning but Sundays to buy crawfish from 80 to 100 fishermen out of his Forked Island business, Donni’s Bait. He hand-picks the mudbugs and cleans them with fresh water. The stars of the show at Cajun Claws are the crawfish, but don’t miss the pillowy, crunchy, fried shrimp while you wait for your table, also on the menu are shrimp boiled to perfection. Cajun Claws owner and boil master Donnie Choate over sees the bubbling pots in a small room in the back of the restaurant with the air full of steam and spice and rock n’ roll blaring on an old stereo. – Fresh, innovative and interesting cocktails are the name of the game at Social Southern, which serves up both traditional drinks and cocktails that stretch the limits. Their custom-built cabinets containing specialty bourbons are overflowing, they routinely offer special whiskey events and serve “Social Outcask,” a fun whiskey marriage they perform at the restaurant. Social is also one of the few restaurants in Louisiana to serve the rare Pappy Van Winkle bourbon, which helped Social snag the distinction of one of the top bourbon bars in the nation. “Our bourbon selection is what we feel is the best in Acadiana,” Thom said. In addition, the restaurant offers a wide selection of “non-mainstream” wines and craft beers. And if that’s not enough incentive to visit, they offer happy hour Tuesdays through Fridays with beer specials on Saturdays and $5 Old Fashioneds all day on Wednesdays. Chef Bonnie Breaux, the current Louisiana Seafood Queen who helms the kitchen at St. John Restaurant in St. Martinville, took one look at the space once occupied by the popular Café des Amis and wanted to leave. The former Breaux Bridge restaurant was vacant for nine months and a wreck so, though her boss Chip Durand visualized a new restaurant in the space, Breaux wasn’t buying. Eventually, the exposed brick walls, the pressed tin ceiling and other elements of the former coffin factory — yes, coffins — won Breaux over. Durand and Breaux transformed it, keeping the base of the bar, some of the original lighting and the massive elevator that carried coffins to the second floor. The signatures that once graced the walls of Café des Amis are painted over, except Ali Landry’s, Miss USA 1996 who hails from Breaux Bridge, and actor Dan Aykroyd. If locals despair over the loss of those autographs, they may view photos of the signatures on a back wall. Café Sydnie Mae is named for Chip Durand’s mother, the first woman elected state representative for District 46, which includes Breaux Bridge. The restaurant serves seafood dishes such as stuffed flounder, certified Angus beef steaks, double-boned pork chops, Breaux’s award-winning shrimp and grits and a new dish she calls Teche Wellington, a puff pastry stuffed with crawfish, crab and shrimp that’s topped with a sherry seafood cream sauce. Desserts include white chocolate bread pudding, pecan cobbler a la mode, crème brûlée, pot de crème and gateau de sirop made with Louisiana Steen’s syrup served in a mini cast iron skillet. Lunch involves more traditional Cajun dishes and hamburgers, sandwiches and plate lunch specials while dinner leans toward more upscale servings. The restaurant also includes a full bar serving specialty cocktails and a wine rack of 168 bottles — including selections from Landry’s Vineyards outside Monroe. Chef Bonnie Breaux stands by the bar in the dining room of downtown Breaux Bridge’s newly renovated restaurant space Café Sydnie Mae where she is executive chef. Breaux is serving her unique take on Louisiana cuisine and beautiful cuts of meat like this double-bone, center-cut pork chop. Pat Huval started Pat’s Fisherman’s Wharf Restaurant in 1948, and the restaurant has served seafood dishes fresh from the bayou ever since. Since its humble inception next to the Atchafalaya Basin levee, the restaurant has grown to include the Atchafalaya Club, where live bands perform Cajun, zydeco, swamp pop and popular music on a regular basis. 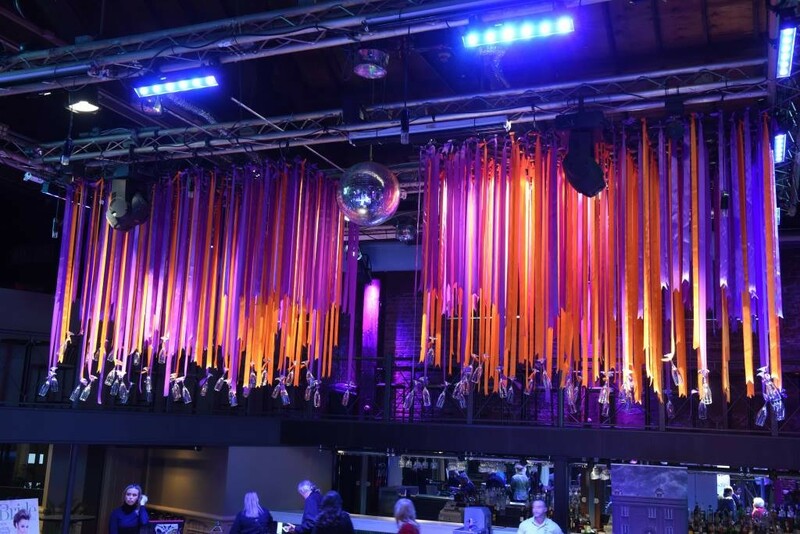 The club remains a popular place for both the great acts that perform there and the enormous dance floor. “I absolutely loved playing there,” said Wayne LeBlanc, drummer with Stop the Clock cowboy jazz band that routinely plays Pat’s. “Mr. Pat, his family, and all the staff were always great people to work with. They created a wonderful venue for dancing and dining. “I will never forget the first time I walked in with my drums to set up,” LeBlanc continued. “Wow, could not get over how big of a place they had built and how well it was laid out. We were always able to get a great sound in that room, and fortunate to play for appreciative crowds throughout the years. “Bottom line, a great place for all to enjoy an evening of dining, socializing and dancing,” he said. Someone once asked why Dunkin’ Donuts wasn’t available in Acadiana. The answer? Too many local shops serving up fabulous sweets. One great example is Karen and Savann Mok, entrepreneurs who have owned a car lot and trucking company. “They’ve done it all,” said their daughter Julie Mikolajcyk. When family in Houston who owned a donut shop taught them their recipes, the Moks decided to try their hand at donuts too. They opened Jak’s on Verot School Road in Lafayette, serving up a wide variety of delectable goodies, from breakfast tacos to apple fritters. This year the family will open their second location in Broussard, operated by Mikolajcyk. Jose Lugo moved his family from Venezuela to Cajun Country for an oil industry job, but that didn’t stop his wife, Wanda Lugo, from reminiscing about her home country’s food, particularly arepas, a cooked corn flour patty. Wanting to introduce Acadiana to Venezuelan food, she opened Patacon in Lafayette, serving up a variety of arepas, empanadas and patacones, the latter flattened plantains twice fried and served with ingredients such as cheese, avocados and sauces. Patacon serves up their arepas for lunch and dinner and includes wonderful accompaniments such as shredded beef, pork, chicken and black beans. The Reina Pepiada tops an arepa with a chicken and avocado salad and the Pabellón marries sweet plantains, mozzarella cheese, black beans and shredded beef on the corn patty. The patacones range from crawfish and shrimp to shredded beef, chicken and pork. Like the arepa counterpart, there’s a Reina Pepiada patacone consisting of green plantains, cheese and chicken avocado salad. Because the dishes revolve around corn and plantains, the menu’s gluten free. And then there’s chicha, a blended rice drink consisting of vanilla, cinnamon and condensed milk. At first, locals were hesitant to try Latin food unfamiliar to them, but word quickly spread and business picked up. The restaurant is in its third year, receiving great reviews online, and the Venezuelan specialities are now available for delivery through Waitr. Patacon takes its name from the signature dish of fried plantains stuffed with your choice of meat, shrimp or cheese. Also on the menu are traditional Venezuelan items like arepas and pastelitos. Top to bottom: Patacones (crispy fried green plantains) filled with chicken and shredded pork, pastelitos (puff pastry), empanada, tajadas (fried plantain slices), and an arepa from the Venezuelan restaurant Patacon. -Matt Blanchard hails from a family of great cooks so he seemed destined to enter a culinary career. After working in catering in Memphis, Blanchard bought a food truck in 2014, smoking meats at night outside his home and serving up barbecue lunches Tuesdays through Saturdays on Lafayette and New Iberia streets. “I love to play at all types of barbecue,” Blanchard said. This year, Blanchard moved his business into a brick and mortar spot, parking the truck for special events such as weddings. The new restaurant includes his wide variety of Central Texas-style barbecue dishes but also other menu items and a full bar. Because he’s now housed in a restaurant, Blanchard built a pit room behind the establishment to smoke his meats. “Luckily, there’s a massive cemetery behind us and I don’t think they will complain,” he said. Plate lunches reign supreme in Acadiana and Mama Reta’s in downtown Lake Charles knows how to serve them up right. The family-owned business closes on Saturdays but weekday lunch specials include smothered pork steak, baked and smothered chicken, meatball stew and fried and grilled catfish on Fridays. Sundays mean barbecue and the special lunch served from 10:30 a.m. to 2 p.m. consists of baked or fried chicken, barbecue pork steak or barbecue ribs. And you know there’s a long list of sides. The menu also includes burgers and sandwiches, baskets of chicken wings or catfish and gumbo, not to mention sweet potato pie for dessert. Mama Reta’s recently launched its second location at 1115 Sampson Road in Westlake, open 10:30 a.m. to 5 p.m. Monday through Friday. When Acadiana thinks of steaks, Lester Darden comes to mind. Darden was a World War II veteran, an elder member of the Chitimacha Tribe who helped draft the tribal constitution and served in tribal government. When Cypress Bayou Casino opened it seemed a natural to name its fine dining establishment after him. Mr. Lester’s Steakhouse, helmed by Chef Scott McCue, serves fresh seafood dishes and a wide variety of steaks, including filet mignon, ribeye, New York strip, porterhouse and Chateaubriand. McCue also offers prime rib on weekends that’s carved to order and nightly specials that combine an appetizer and entrée. “It’s a way for us to do something special and to be creative,” McCue said. The restaurant features an extensive wine collection housed in a private room that seats up to 14 people and premium cigars are available in a separate cigar lounge. McCue arrived in Louisiana to open the restaurant in 1995, moving up to casino executive chef in 2011. He’s a member of the American Culinary Federation, a founding member of the Atchafalaya Basin Chapter of The American Culinary Federation and has been awarded numerous medals in culinary competitions. Mr. Lester’s routinely nabs awards, including being named Best Steakhouse in the Best of Acadiana awards. Roasted carrots and kale salad are a few of the sides that accompany the wood fire cooked pizzas at Central Pizza & Bar. From left to right are The Curly Sue, Cherry Pie and the Muffuletta. On the table is Mr. Lester’s pepper crusted ribeye cooked to order and topped with melted butter, the crab salad with artichoke hearts, plus housemade herb butters for the bread basket with freshly baked bread. Many times, restaurants are born from conversations among friends or culinary professionals. Such was the case with Central Pizza & Bar when five friends with varied restaurant experience started talking about the absence of pizza in downtown Lafayette. Move ahead a year and the restaurant becomes a reality, opening March 16 on Jefferson Street in the heart of the Hub City. 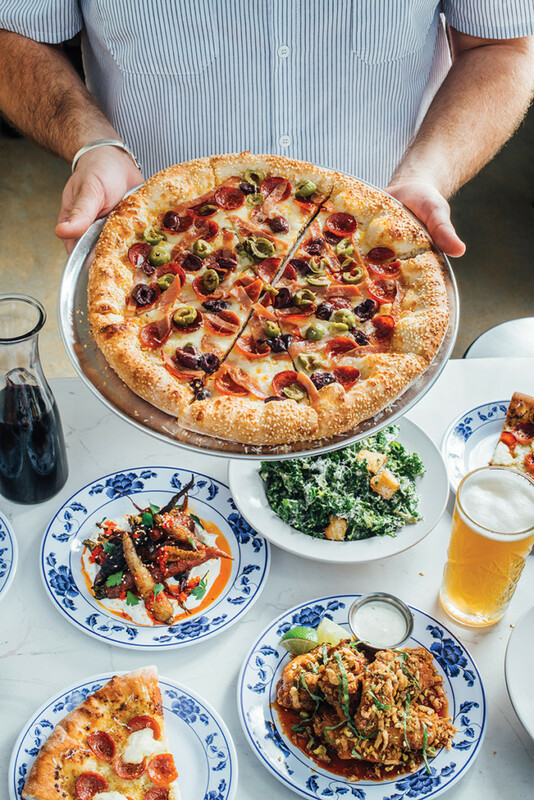 Petersen owns Swamp Pop Sodas with cousin Chef Collin Cormier, who developed the menu at Central Pizza, which consists of red and white pizza pies, salads, small plates and desserts. “We knew we wanted to do a wood-fire, brick-oven style,” Petersen said, adding that the ovens allows more delicacy with toppings and the resulting pizza won’t force people to take naps when they return to work. “The dough will be a bubbly, slightly charred crust that you typically get from a wood-fire oven,” he added. Cormier owns Pop’s Poboys in downtown Lafayette, a restaurant known for elevating the traditional poboy to new flavors and heights. He plans to do the same with Central Pizza, Petersen explained, creating the traditional backbone of dough, sauce and mozzarella and then adding new flavors and styles, such as pistachio pesto and roasted garlic ricotta. Central Pizza contains a 25-foot-long bar and will serve wine by the carafe, local beers and original and traditional cocktails. There’s a seating area in front, two-tops along the side wall and booths, all arranged to give the restaurant a communal feeling, Petersen said. “We really wanted to give the place a cozy, metropolitan feeling,” he said. In the future Central Pizza may open their front window facing Jefferson Street to offer late-night slices to go and to accommodate outside seating. “Those are ideas we want to develop over time,” Petersen said. – Alzina’s is not your ordinary restaurant. It’s housed in a former welding shop in Galliano not far from Bayou Lafourche, only one party is entertained at a time and owner/chef Alzina Toups accepts no walk-ins. But the food’s so incredible, talk has moved past going up the bayou to Toups winning the prestigious Southern Foodways Keeper of the Flame Award in 2013 and landing the restaurant on “Bizarre Foods with Andrew Zimmern” last summer on The Travel Channel. When Zimmern was asked of hidden gems he discovered with his TV show, he named Toups.